Sato’s new CX208 barcode printer. AUSTAB Barcode Systems has released the latest range of Sato barcode label printers. The CL408e and the higher resolution CL412e printers are built on the proven CL4 series, but have just had a ‘technology lift’. The enhanced series now come with a higher speed 32-bit RISC processor, running at 133MHz. That means it can print labels and tags at high speed even when text and graphics change between labels. Crisp, clear graphics and barcodes are printed in an instant. Plug-in upgrade and expansion modules make the CL series printers future proof. Built on a sturdy steel chassis and housed in a durable steel cabinet, the Sato printers to have a long service life. Also newly released is the compact, lightweight, flexible and cost effective Sato CX208, described by Sato as ‘a revolution in barcode label printing’. Its all in one. From less than $990 including GST the CX208 is one of the smallest and fastest printer in its class. Suitable for lower volume printing of on demand barcode labels, it's a very versatile printer. It can print labels for barcoding, dispatch, address labels, product labels, and inventory control. 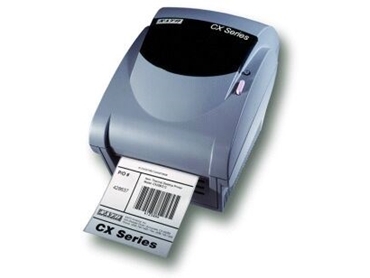 The CX208 is supplied with label design software capable of printing all the major barcodes, and comes with both parallel and serial interfaces as standard. It connects easily to almost any PC. The CX208 prints graphics, company logos, barcodes, text, serial numbers, consecutive numbers, date and batch numbers. Austab Barcode Systems also has a full range of thermal ribbons and labels to suit most applications. Custom sizes are made to customer specifications.